Hot on the heels of last week’s Fly Tying Expo, we are excited to organize a new family friendly RMF fly tying evening. Drop by to tie flies with your Flycaster colleagues, or help introduce a newcomer to the craft! You might decide to just enjoy a beverage and visit with the other trout bums! Each event will feature a fly pattern, beginning this first week with for Rick Takahashi’s Go2 Caddis. RMF will provide hooks and materials, so all you have to do is show up with your vise and tools. (We’ll even have loaner equipment for beginners.) The big screen TV will be playing a YouTube instructional video which you can also watch on your own Ipad or smart phone. Marty Staab will be hosting this event, so contact him by email with any questions or to RSVP. Please include a comment to to let him know if you intend to participate in the featured pattern, and especially if we can help provide tools and a vise. I hope to see a lot of you at the Gilded Goat March 6 from 6 pm to 8 pm. 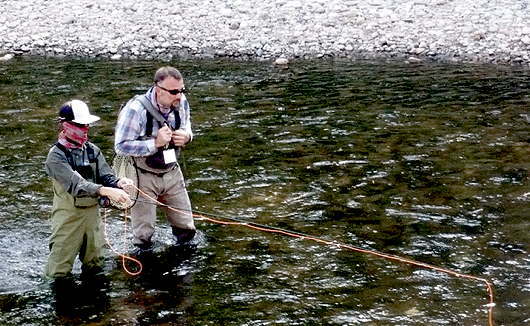 We’re getting close to the biggest celebration of the year for Colorado’s rivers and trout! We hope you’re able to join Colorado TU for a fun night of food and drink, silent and live auction, and award presentation — all with an eye toward highlighting 50 years of conserving, protecting, and restoring Colorado’s rivers and fisheries. Click here to join us on March 7th! We’ll also be honoring former EPA Administrator William Reilly with the 2019 River Stewardship Award for his veto of Two Forks Dam in 1990. Mr. Reilly’s courageous action not only protected a treasured river and valley that stood to be inundated by the new reservoir, but helped spawn new, more collaborative approaches to water planning and management that have benefited Colorado rivers and communities. We hope you can join us for this celebratory event! Even if you cannot make the event, you can still bid for items on the live auction. Send an email to Shannon and you will be notified when the online auction goes live. Ben Zomer hosts this FULL UP into Wyoming. Typically eight people, this time Ben was able to get four cabins for sixteen fishers. It should be a terrific trip as a number of people are repeating the adventure. Due to potential blizzard conditions, the Leadership meeting is postponed until Tuesday, March 19. Members are welcome to attend any board meeting. Check with a Board Member for the meeting location and/or agenda. Leadership meeting Tuesday, March 19. Members are welcome to attend any board meeting. Check with a Board Member for the meeting location and/or agenda. Hear what’s going on with the watershed coalitions, some research from CSU and, for the first time, physical therapists will give us some suggestions for keeping healthy and uninjured on the rivers and lakes. We will hear from Shayna Jones, Executive Director of the Big Thompson Watershed Coalition, Jen Kovesces, Executive Director from the Coalition for the Poudre River Coalition; Alex Townsend, our sponsored student from CSU and Sarah Baily, Physical Therapist, from Rocky Mountain Physical Therapy. Social hour and fly tying demonstration begins at 6:30 pm at the Fort Collins Senior Center, and the program follows at 7:00 pm. We often have a local fly tier at each general meeting and an equipment raffle following the meeting. Admission is free and the public is welcome. The Fort Collins Senior Center is located at 1200 Raintree Drive off Shields Avenue between Prospect and Drake. Additional meeting information. New for 2019, new and existing Wildlands Restoration Volunteers leaders will come together for two fun and informative weekends to learn leadership and technical skills and build our growing leader community. WRV and RMF work together with other partners on restoration projects. To become a leader at WRV, in addition to the weekend training you must also complete required on-project mentoring later in the year. You will then be certified by the Outdoor Stewardship Institute to lead on projects at WRV or other organizations that accept the OSI certification in Colorado and beyond. Some activities are also eligible for credits through the Society for Ecological Restoration towards their restoration practitioner certification program. Training session continues Sunday 31 March. If you have questions, please contact RMF Volunteer Coordinator Phil Wright or reach out to Rachel Brett by email or 303.543-1411 x109. A similar training program takes place in Boulder March 16-17. 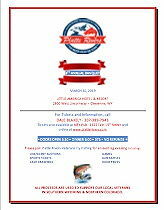 PRVFF for the eighth year is holding a banquet and auction to raise funds for veterans’ programs. These programs include fishing trips, fly tying sessions with instructions, fly rod building, and social get-togethers at no cost to the veterans enrolled. For tickets and information, call Dale Blakely at 307-389-7943 or online at www.platterivers.com. Tickets also available at Alf’s Pub, 1622 East 19th Street in Cheyenne. Tickets are $75. ALL PROCEEDS ARE USED TO SUPPORT OUR LOCAL VETERANS IN SOUTHERN WYOMING & NORTHERN COLORADO.